Each market has their characteristics. For example, the wholesale market is very sensitive to price variations. If your prices rise half-cent, you may lose the customer. As you do not have anything to retain the customer, they just finish their prepaid credit and move to another vendor without saying anything. The domestic market, a home user, has more tolerance to failures, but they can get easily frustrated and port out their number. The only way you may retain them is by reporting a balance on their account. The business market is very tolerable to faults; porting-out a number is very painful, and businesses prefer to deal with the error instead of moving out. Of course, there is a limit for everything. This table is not an absolute truth. 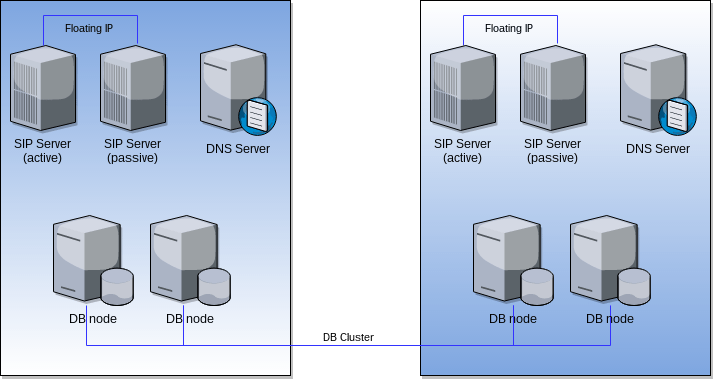 For example, you could start only with a load-balanced cluster if you are targeting the domestic market, and eventually add the high availability. Your cluster needs to be able to grow horizontally (adding more nodes) and vertically (increasing server specifications). Load-balanced clusters are very flexible to grow horizontally while high availability cluster does so vertically. Remember both approaches are not exclusive to each other, you can combine them in a bigger cluster. In OKay, we can help you to achieve this. Bill per minute: The simple one. Each destination has its own price and depending on where you are calling to, the rate will be assigned. You can choose your billing increment X/Y (connect, talk). It is very common to bill per minute to domestic or calling card (60/60), per second (1/1) to businesses, and the famous six-seconds increment (6/6) to the wholesale market. Bill per call: It will not take in mind the length of your conversation. The per-call scheme (X/0) is common in some countries for domestic or business market. Bill a flat rate: You just bill a static amount regardless if the PBX is used or not. You will need also to define a profit percentage. Usually, 30% is a good profit. This price will depend on what carriers you select. In OKay, we can help you select the best carriers that satisfy your business strategy. You can mix some pricing schemas, for example. Bill per call to US and Canada (domestic calls) and per minute to International. The Billing for FusionPBX software will help you on this. You can also add some static charges, for example, E911 charges, 1 dollar minimum service charge, rent of hardware and others. The way you do your pricing scheme is a key piece of your business success. This decision depends on the market you are targeting. Don't panic! The truth is VoIP is one of the most complex systems. Many protocols interact in order to make possible a user plug their phone, it auto-configures, it places or gets a call for example. Networks are not always VoIP friendly, for your peace of mind, OKay offers support by hourly-package or as pay as you go. You will focus on your selling and customer care. You may need to choose a good name. It is smart to use the TLD domains as part of your domains name to make it easy to remember. For example, To Call Me, which domain is to-call.me. When choosing a brand name and a domain name, do not forget that Google trends to show geographic TLD to the linked geographic zone. For example, all .ca domains names will have the preference if you google it from Canada rather from another country. Your webpage must be eye-catching, with the last web tendencies and fully responsive. The webpage must be coded in a way that Google does not punish it. The text in the article must use the correct keywords. In other words, SEO optimized. Finally, your question. How much would the start kit cost? The following table will help you, please note prices are relative and they are calculated if all services are provided by OKay. So, you may need around 1200 USD to do the kickstart with monthly recurrent costs of 300 USD approx assuming you do not need any kind of support. Please notes this is a rough approximation. Other costs may incur. Also, please note that you will need to consider any extra employee; if you are starting, it is reasonable to start yourself, but eventually you may need someone to help you.